Home arrow_forwardEmail Digest System Notifications Blogarrow_forwardDoobert does Local Rides! We’re excited to announce the launch of our Doobert Local Rides functionality. Organizations can quickly setup their favorite locations and publish local ride requests via text messages to volunteers. Volunteers can setup a local ride profile with the times of day that they’re available and add their mobile number to receive text alerts for new rides. 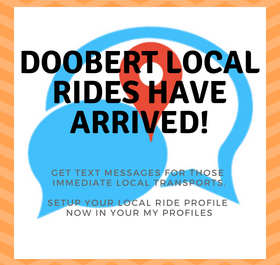 Check out the Doobert Local Ride functionality today! Had hoped something like this would come into existence. Thanks Stephen. Definitely love to bring new ideas to life so please let me know other ones you have for how we can help save more animals! Great idea! Did not know there was a demand for this. Thanks Cindy! Yes it seems there is definitely a need particularly in larger cities but I have a feeling there’s more organizations out there that can take advantage of this to quickly notify volunteers to help with local transport or even picking up donations, etc. Hoping it takes off! Awesome! Thanks Tom. Be sure to go and update your LOCAL RIDE profile in your Doobert account if you want to get text messages. You’ll still get emails through the normal process and daily digest as well. Thank you for everything you do!